Hard to use Shackle Shot(WR First Skill) properly. 2. Many of your enemy are hitter. 3. You are smart to read your enemy movements. 2. You haven't read this guide XD. 1. Shackleshot : Alleria fires an enchanted arrow using wind magic that binds the target to an enemy unit or tree behind it. Level 1 - Stun for 0.75 seconds, or 1.5 if close to enemy unit or tree. Level 2 - Stun for 0.75 seconds, or 2.25 if close to enemy unit or tree. Level 3 - Stun for 0.75 seconds, or 3 if close to enemy unit or tree. Level 4 - Stun for 0.75 seconds, or 3.75 if close to enemy unit or tree. 2. Powershot : Windrunner winds up her bow for up to 1 second to perform a single powerful shot. The arrow travels 1700 distance, dealingdamage and destroying trees in its path. The damaged dealt is greatest to the first target of it hits and is reduced by 10% with each other it passes through. Level 1 - Fires an arrow that shoots through targets with 120 initial damage, and 10% reduced damage for each other target hit. Level 2 - Fires an arrow that shoots through targets with 200 initial damage, and 10% reduced damage for each other target hit. Level 3 - Fires an arrow that shoots through targets with 280 initial damage, and 10% reduced damage for each other target hit. Level 4 - Fires an arrow that shoots through targets with 360 initial damage, and 10% reduced damage for each other target hit. 3.Windrunner : Imbues her body with the essence of wind, increasing her movement speed by 50% and giving her the ability to evade all physical attacks for short period of time. Additionally, the gusts of wind around her impairs the movement of nearby enemies, slowing their movementspeed in a 300 AoE around her. 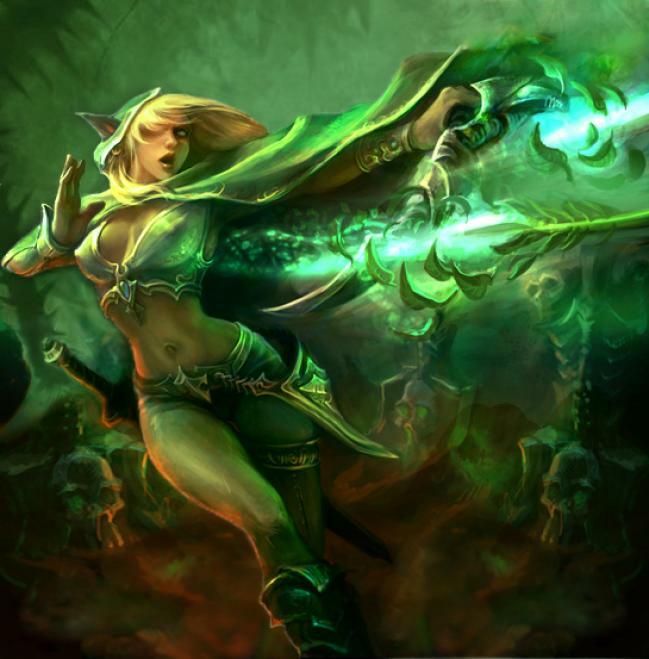 4.Focus Fire : Alleria channels wind throughout her body to surge an excess of adrenaline, giving her maximum attack speed. Damage is reduced in this state. I often play Alleria-Windrunner on the middle lane, but if you on another lane, take shackleshot first. Just in case your team want to do first blood. For Fast game build, you must take focus fire in level 6. Use it to destroy enemy's tower. Before you read the strategy Just read How to use Empty Bottle and another active item tips to ease you. Mid is best choice if you know how to use empty bottle. But if your team want to play fast game, Go to another lane. The Pro often arm Alleria(WR) with Mekansm. For my experience, you could have Mekansm on minute 12(With Boot of Speed and empty bottle, + Maid heroes XD). When your team do ganking, you must join it. It hard for Alleria to kill enemy one by one. And if you have Focus Fire, just use it on tower rather than heroes. Try to positioning yourself on the parallels between your hero, enemy hero, and the enemies creeps or Trees, then use Shackleshot. Better if the stun is between enemy heroes. When your enemy hitter(Usually Carry type) approaching you, use windrunner, But don't run first. Just hit the enemy with all you have. Use mekansm to save your team's ace. don't use it for helping yourself. War on the late game determine who the winner. Counter attack is the best choice for you. Why? You have focus fire ! you can destroy enemy towers just in 5 seconds without any disruption. That's all for Alleria-Windrunner DotA Guide. Enjoy DotA Gamers ! Subscribe us for another hero and item guide, DotA AI map, and latest thing about DotA.